The Magic Wheel was a quarterly magazine for Cyclemaster owners, published by Cyclemaster Ltd. One of the features of the magazine was a selection of photographs on the centre pages. These were under the heading of "Pictures you have sent us" and showed a variety of pictures - supposedly sent in by the owners themseves - of Cyclemasters and their owners. The picture below - captioned as being from a "Mrs Blomfield, of London" - appeared in this feature in October 1953 and it was also used as the cover picture for the same magazine. Yes, it's the same picture - except the front number plate's in a different place. This time, you don't have it examine the picture very closely to realise that both registration plates have been painted onto the photograph. What we have is a posed publicity shot, taken using an un-registered machine. The registration plates were added to the photo to make it look 'legal'. The Owner's Manual pre-dates the picture in The Magic Wheel. So, the top picture shows Cyclemaster's second attempt at adding registration plates to this picture - and a much neater and more convincing job they made of it this time. That's not the only change. Look at the kerb - it's moved. 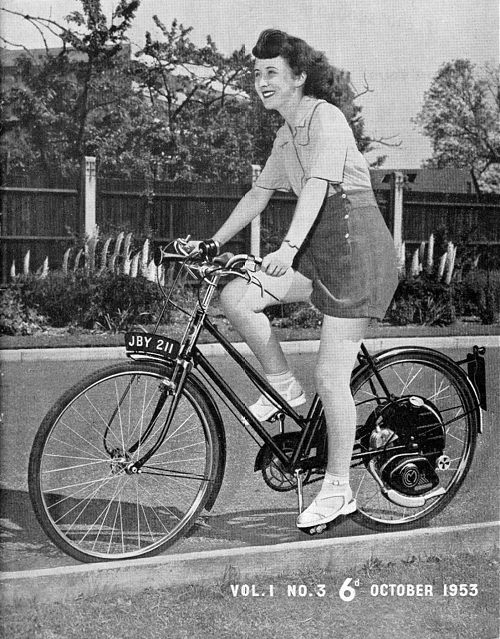 When the photo was taken the model was keeping herself and the bike upright by having the pedal resting on the kerb. 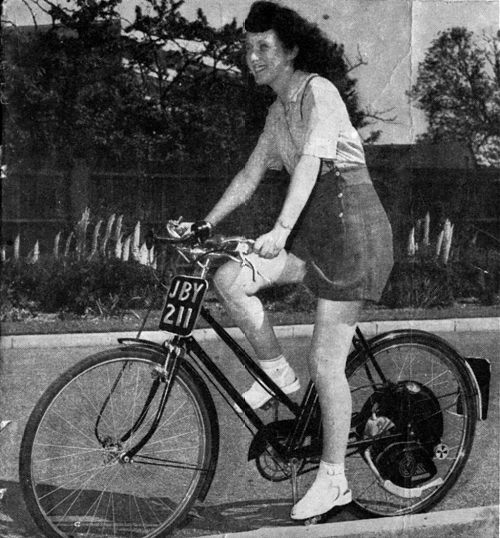 When the photo was retouched for The Magic Wheel, the kerb was repositioned to make it look more as if she was actually riding the machine.